French banker; grandson of Jacob Rodrigues Pereire; born at Bordeaux 1800; died at Paris Jan. 5, 1875. At the age of twenty-two he went to Paris and entered a bank. Four years later he became associated with the economic interests of the adherents of St.-Simonism through Olinde-Rodrigues. In 1830 he was the promoter of a "comptoir d'escompte," designed to benefit commerce and industry, being aided in this by his brother Isaac. In 1852 he founded both the Crédit Foncier de France, which replaced the Banque Foncière, and the Société Générale du Crédit Mobilier, later extending this last institution, with the help of his brother Isaac, into Spain. Pereire's activity in the promotion and organization of railroads was extraordinary. In 1835 he promoted the line from Paris to Saint-Germain-en-Laye; two years later, the Paris-St.-Cloud-Versailles system; in 1845, the Compagnie du Chemin de Fer du Nord; in 1851, the Argenteuil railroad, and in the following year, the Auteuil line and the Compagnie des Chemins de Fer du Midi. Pereire was interested also in some of the railroad systems of Austria, Russia, and Spain, the lighting and heating systems of Paris and the omnibus lines of the same city, the Compagnie Générale Transatlantique, the Madrid Gas Company, the Imperial Ottoman Bank, and many other financial institutions. He was likewise a member of the General Council of the Gironde from 1853 to 1875, and of the Corps Législatif from 1857 to 1870. 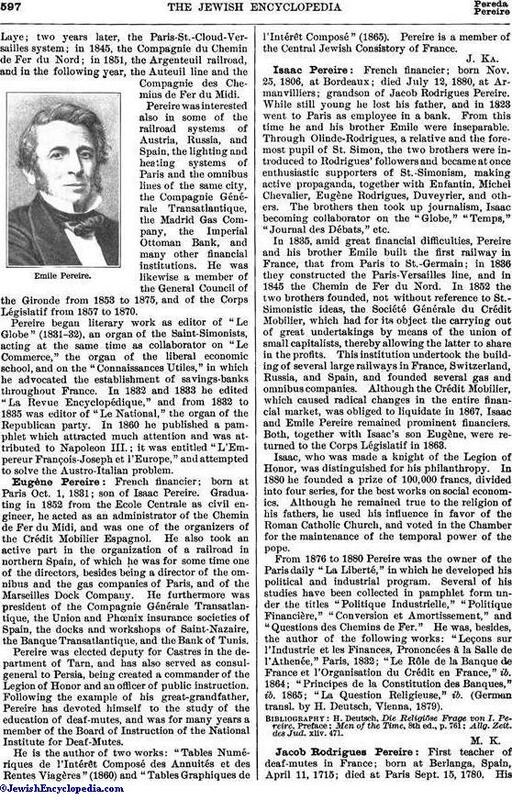 Pereire began literary work as editor of "Le Globe" (1831-32), an organ of the Saint-Simonists, acting at the same time as collaborator on "Le Commerce," the organ of the liberal economic school, and on the "Connaissances Utiles," in which he advocated the establishment of savings-banks throughout France. In 1832 and 1833 he edited "La Revue Encyclopédique," and from 1832 to 1835 was editor of "Le National," the organ of the Republican party. In 1860 he published a pamphlet which attracted much attention and was attributed to Napoleon III. ; it was entitled "L'Empereur François-Joseph et l'Europe," and attempted to solve the Austro-Italian problem. French financier; born at Paris Oct. 1, 1831; son of Isaac Pereire. Graduating in 1852 from the Ecole Centrale as civil engineer, he acted as an administrator of the Chemin de Fer du Midi, and was one of the organizers of the Crédit Mobilier Espagnol. He also took an active part in the organization of a railroad in northern Spain, of which he was for some time one of the directors, besides being a director of the omnibus and the gas companies of Paris, and of the Marseilles Dock Company. He furthermore was president of the Compagnie Générale Transatlantique, the Union and Phœnix insurance societies of Spain, the docks and workshops of Saint-Nazaire, the Banque Transatlantique, and the Bank of Tunis. Pereire was elected deputy for Castres in the department of Tarn, and has also served as consulgeneral to Persia, being created a commander of the Legion of Honor and an officer of public instruction. Following the example of his great-grandfather, Pereire has devoted himself to the study of the education of deaf-mutes, and was for many years a member of the Board of Instruction of the National Institute for Deaf-Mutes. He is the author of two works: "Tables Numériques de l'Intérét Composé des Annuités et des Rentes Viagères" (1860) and "Tables Graphiques de l'Intérêt Composé" (1865). Pereire is a member of the Central Jewish Consistory of France. French financier; born Nov. 25, 1806, at Bordeaux; died July 12, 1880, at Armanvilliers; grandson of Jacob Rodrigues Pereire. While still young he lost his father, and in 1823 went to Paris as employee in a bank. From this time he and his brother Emile were inseparable. Through Olinde-Rodrigues, a relative and the foremost pupil of St. Simon, the two brothers were introduced to Rodrigues' followers and became at once enthusiastic supporters of St.-Simonism, making active propaganda, together with Enfantin, Michel Chevalier, Eugène Rodrigues, Duveyrier, and others. The brothers then took up journalism, Isaac becoming collaborator on the "Globe," "Temps," "Journal des Débats," etc. In 1835, amid great financial difficulties, Pereire and his brother Emile built the first railway in France, that from Paris to St.-Germain; in 1836 they constructed the Paris-Versailles line, and in 1845 the Chemin de Fer du Nord. In 1852 the two brothers founded, not without reference to St.-Simonistic ideas, the Société Générale du Crédit Mobilier, which had for its object the carrying out of great undertakings by means of the union of small capitalists, thereby allowing the latter to share in the profits. This institution undertook the building of several large railways in France, Switzerland, Russia, and Spain, and founded several gas and omnibus companies. Although the Crédit Mobilier, which caused radical changes in the entire financial market, was obliged to liquidate in 1867, Isaac and Emile Pereire remained prominent financiers. Both, together with Isaac's son Eugène, were returned to the Corps Législatif in 1863. Isaac, who was made a knight of the Legion of Honor, was distinguished for his philanthropy. In 1880 he founded a prize of 100,000 francs, divided into four series, for the best works on social economics. Although he remained true to the religion of his fathers, he used his influence in favor of the Roman Catholic Church, and voted in the Chamber for the maintenance of the temporal power of the pope. From 1876 to 1880 Pereire was the owner of the Paris daily "La Liberté," in which he developed his political and industrial program. Several of his studies have been collected in pamphlet form under the titles "Politique Industrielle," "Politique Financière," "Conversion et Amortissement," and "Questions des Chemins de Fer." He was, besides, the author of the following works: "Leçons sur l'Industrie et les Finances, Prononcées à la Salle de l'Athenée," Paris, 1832; "Le Rôle de la Banque de France et l'Organisation du Crédit en France," ib. 1864; "Principes de la Constitution des Banques," ib. 1865; "La Question Religieuse," ib. (German transl. by H. Deutsch, Vienna, 1879). Allg. Zeit. des Jud. xliv. 471. First teacher of deaf-mutes in France; born at Berlanga, Spain, April 11, 1715; died at Paris Sept. 15, 1780. Hisfather, Abraham Rodrigues Pereira, and his mother had been obliged to profess Christianity, and Jacob himself was baptized with the name of Francisco Antonio Rodrigues, which he later signed to certain pamphlets in Spain. After his father's death his mother fled with her son from Portugal to escape the charge that she had relapsed into heresy, and about 1741 she settled at Bordeaux. After ten years of study of anatomy and physiology and numerous experiments on congenital deaf-mutes, Pereire received on Jan. 19, 1747, the first testimonial for his labors from the Royal Academy of Belles-Lettres of Caen. In 1749 he set forth his system in a memoir before the Royal Academy of Sciences at Paris. In the following year Louis XV. granted him 800 pounds as a mark of esteem. A memoir read before the Academy on an arithmetical machine which he had invented brought him a pension of 800 pounds annually from the king (Oct. 26, 1751), while in 1753 he received honorable mention at a conference held by the Academy to determine the most advantageous methods of supplementing the action of the wind on large sailing vessels. In 1760 the Royal Society of London made Pereire a member, and in 1765 he was appointed royal interpreter for Spanish and Portuguese. On Nov. 5 of the following year he married his kinswoman Miryan Lopes Dias. His foreign birth, his Jewish faith, and a certain timidity of character, however, all conspired against Pereire, and the sharp competition to which he was exposed compelled him to yield to his rival, Abbé Charles Michel de l'Epée, in whose favor the council passed a decree (Nov. 21, 1778) which placed the school of deaf-mutes, founded by the abbé, under the protection of Louis XVI. 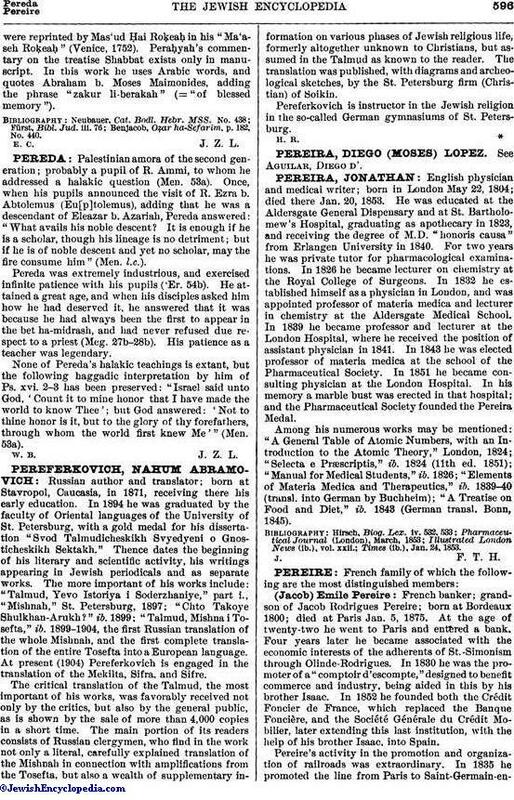 Throughout his life Pereire was devoted to the welfare of the Jews of southern France, Portugal, and Spain. 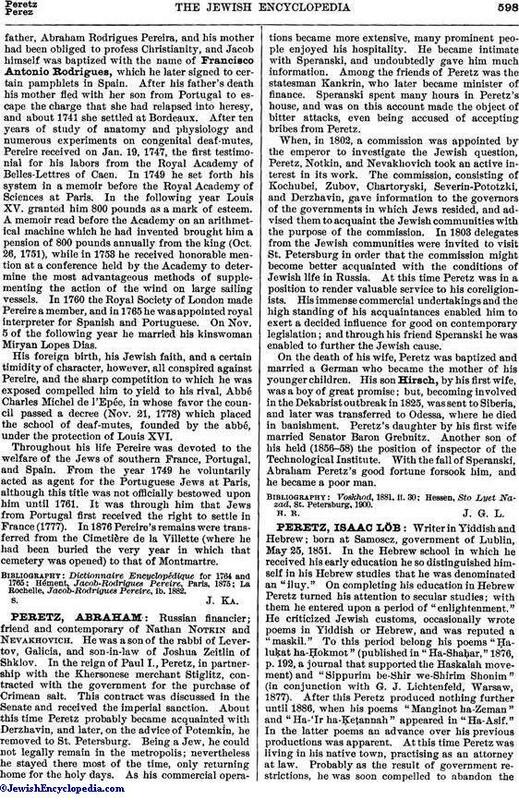 From the year 1749 he voluntarily acted as agent for the Portuguese Jews at Paris, although this title was not officially bestowed upon him until 1761. It was through him that Jews from Portugal first received the right to settle in France (1777). In 1876 Pereire's remains were transferred from the Cimetière de la Villette (where he had been buried the very year in which that cemetery was opened) to that of Montmartre. La Rochelle, Jacob-Rodrigues Pereire, ib. 1882.